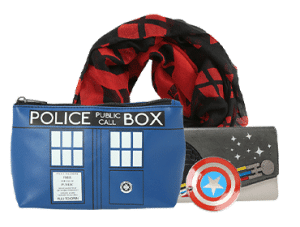 Every month Loot Wear by Loot Crate sends subscribers unique, and sometimes exclusive, geek clothing and accessories. 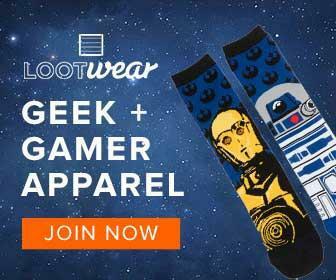 There are 5 Loot Wear monthly subscription boxes you can subscribe to: Loot Socks, Loot Tees, Loot Wearable, Loot for Her, and Underwear. With today’s Loot Crate Loot Wear review, we’re unboxing the December 2016 Loot Wear geek fashion subscription boxes. 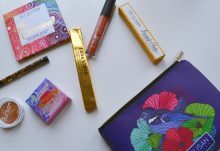 The Loot Wear December 2016 theme was REVOLUTION. December’s Revolution Loot Tees shirt is an Invader Zim Tee. 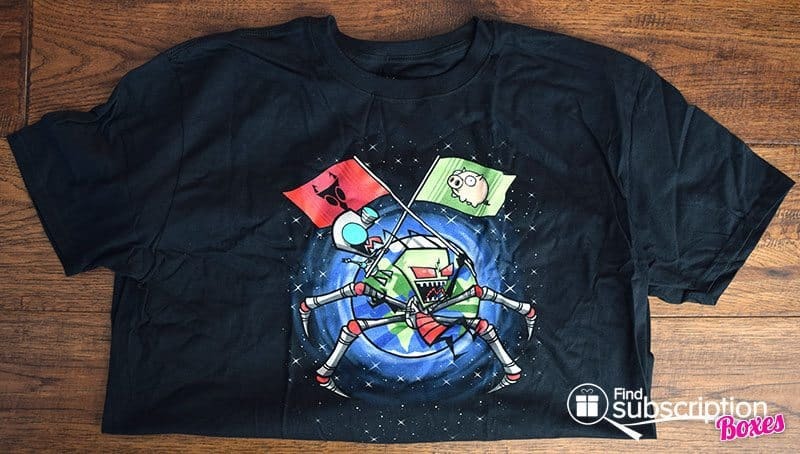 This shirt has Zim and his robot sidekick, GIR, on their way to conquer Earth. Pigs often appear in the Invader Zim universe, and one makes an appearance on this shirt too. 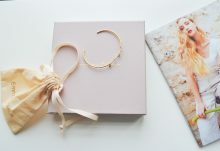 Next up is the December Loot Socks collection! The latest Guardians of the Galaxy 2 trailer just came out, so this month’s Rocket Raccoon Socks were right on time. They have the Guardians badge on the cuff and “Rocket” printed in gold on the bottom. For the vigilante hacker, these Mr. 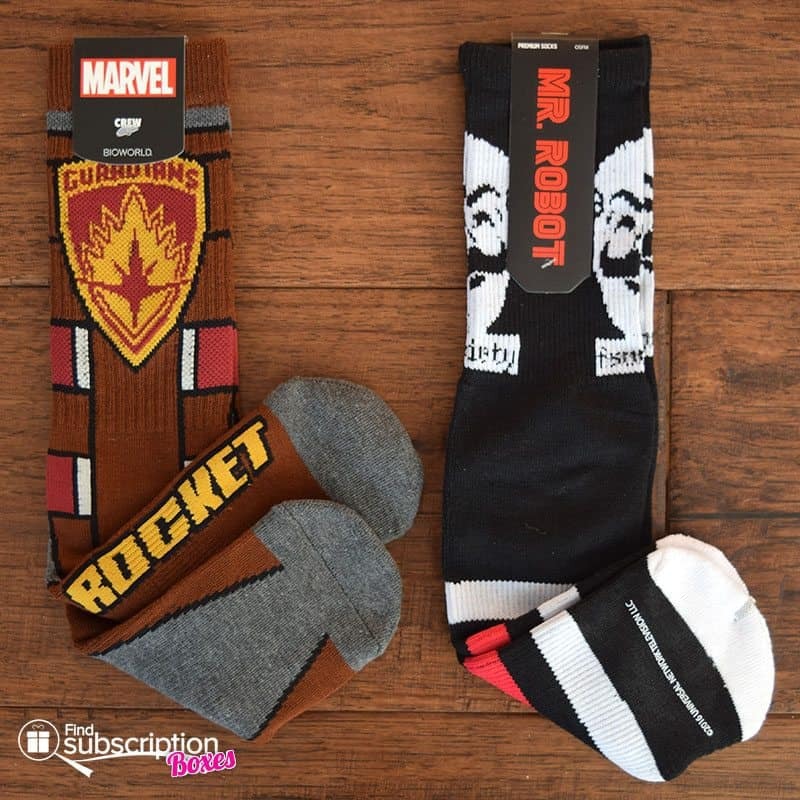 Robot Athletic Socks add that extra bit of rebellious style. December’s Loot Wearables item was a colorful Mr. Meeseeks Hoodie. From Rick & Morty, Mr. Meeseeks is a creature with a large, bulbous head and wide mouth that is summoned by a Meeseeks Box. 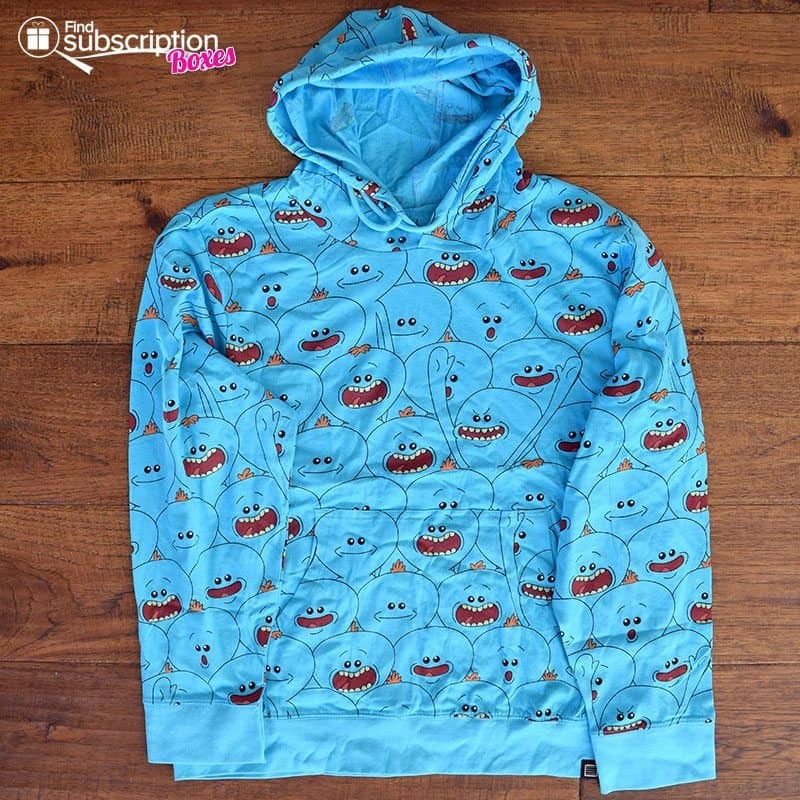 This lightweight hoodie has Mr. Meeseeks printed all over. 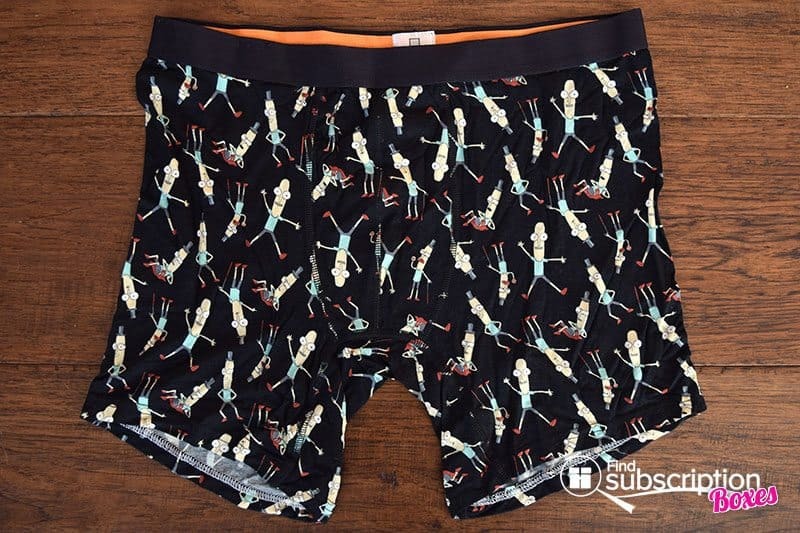 The Revolution December Loot Undies item was Mr. Poopybutthole Underwear. 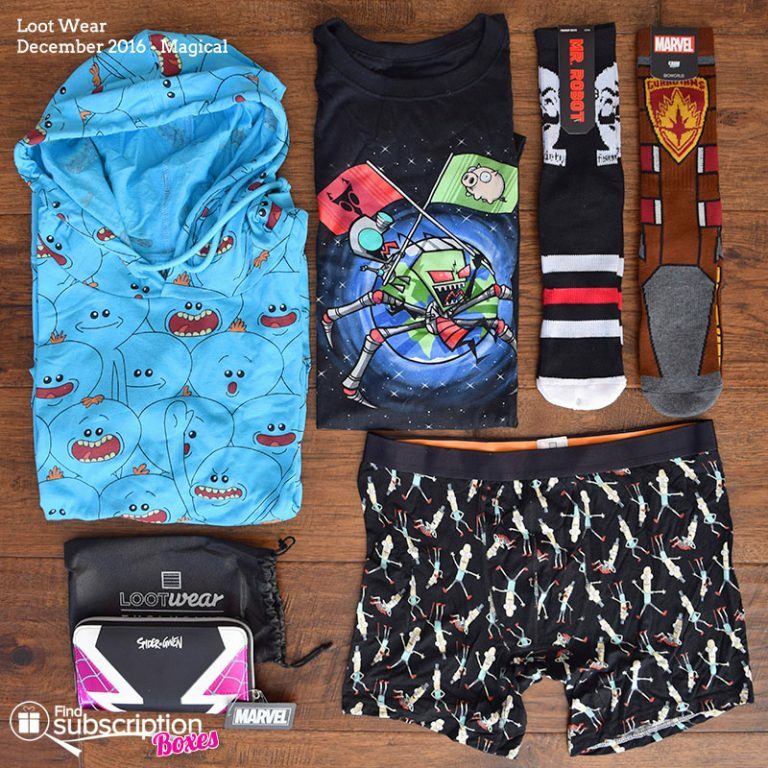 Also from Rick & Morty, this Loot Wear underwear has Mr. Poopybutthole, a good friend of the Smith family. 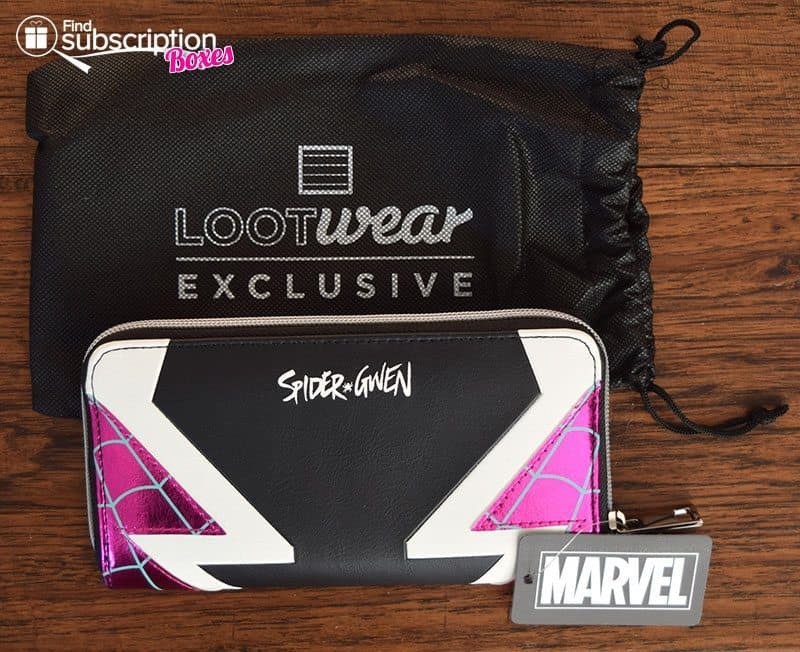 The December Loot for Her Revolution item was a bold and stylish Spider-Gwen Zip Wallet. Modelled after Gwen Stacy’s Spider-Gwen costume, this zip wallet has two handy compartments, an inner zippered coin pouch, and lots of pockets for IDs or credit cards. What was your favorite December 2016 Loot Wear apparel item? 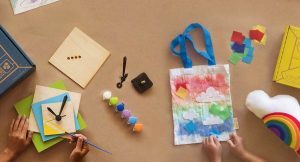 Use Loot Wear coupon code SAVE3 to save $3 off any new Loot Wear subscription. Join today! 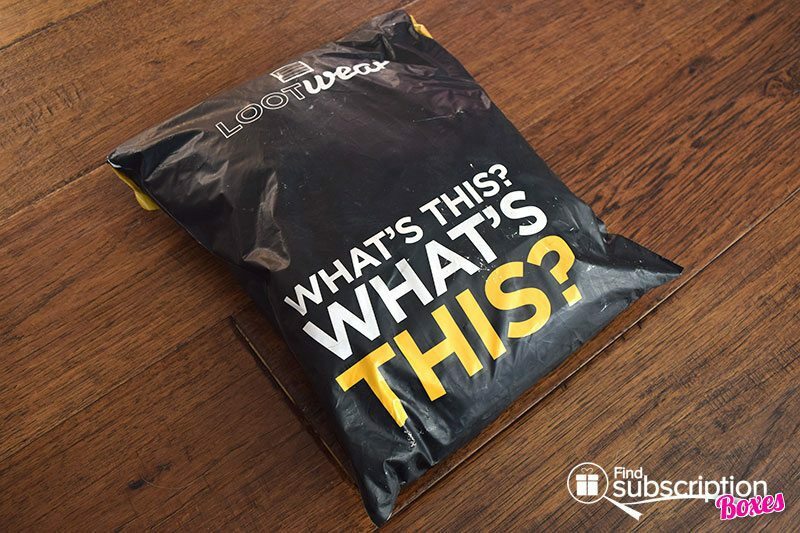 How would you rate Loot Wear by Loot Crate ?